We have made a big decision in regards to the rest of the travel we do this year – we are going carry on only! And we are going to share our family packing list below. Are you up for the carry on only challenge? 1 Why travel carry on only? Why travel carry on only? I think a better question is if you can, why not? I have always loved travelling carry on only. It just gives me so much freedom and flexibility. 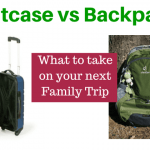 One of the biggest adjustments for me when we first started travelling with kids was upgrading from a 25L backpack to two suitcases and two 25L backpacks. The amount of luggage we had to carry when the kids were babies and toddlers prevented us from doing some of the travel we would have liked to. The more luggage we have, the harder overland travel becomes. Some public transport is off limits with big backpacks or suitcases. Even when it is doable, it becomes more complicated, especially when you have young kids you need to hold onto (and often lift/carry) as well. Since we often fly budget airlines, it is also cost effective to travel carry on only. This saves us a fair bit of money. It also saves time at airports. In fact when you add up additional transport options, the money saved on luggage fees at airports and the fact that small hotel rooms are fine without a lot of luggage, then we can save a fair bit by limiting our luggage. I also find that not having much luggage makes me less of a target for touts when we arrive in new places. I also like that travelling carry on only forces us to travel light. I find that no matter what size bag I take away, it tends to be filled up. Really this just means that we take lots of stuff that we don’t really need. Small backpacks and trunkis will help us avoid this. They also save our back. I also think that once you take a look at just how much you can take even when travelling carry on only, it can be quite inspiring. It is definitely enough stuff, and we are not missing out. Really, why wouldn’t you travel carry on only if you can at all manage it? We are taking two backpacks and two trunkis. We are also going to take a bag of nappies and hope we get away with it. The kids both still wear nappies at night. 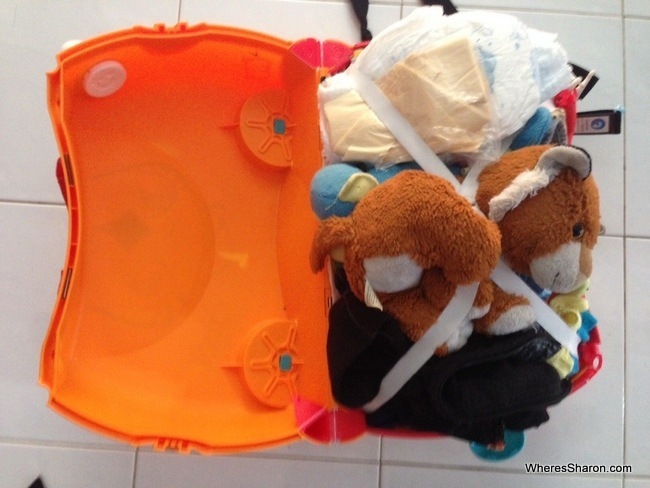 Outside of Malaysia, we have found it close to mission impossible to find nappies big enough for our kids (who are very big for their ages) in Asia so we feel we have to take enough with us for our three weeks in Sri Lanka. This is the biggest obstacle we have with going carry on only. 50 odd nappies is a lot. 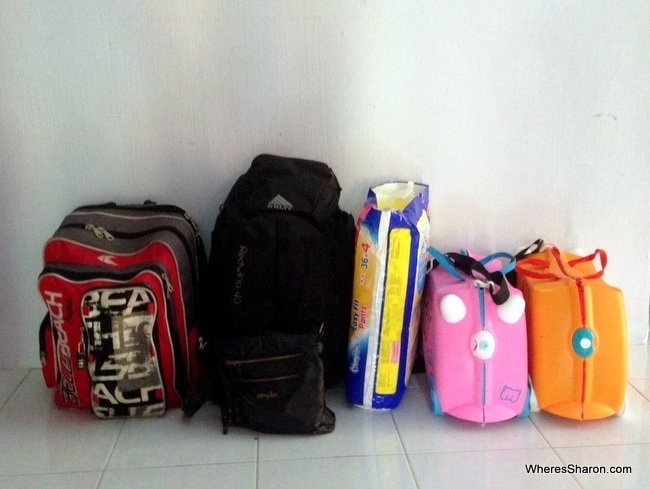 On the way to Asia, we had an extra backpack just full of nappies! The backpacks are a 30L backpack and my new, very much loved, 40L Kelty Redwing. This bag does go over the allowable dimension for depth if I fill it all up, so I have been careful not to do this. Once we are in Sri Lanka, this will give us extra space for the nappies and anything else we carry along with us like a big bottle of water. You can read more about our backpack recommendations here and our thoughts about suitcases vs backpacks. What you have been waiting for – our actual family holiday packing list! The biggest reason I switched to carry on only was after reading someone else’s packing list and realising how reasonable the amount they were taking was… Perhaps you will feel the same after reading this! This is for a three week trip to Sri Lanka. We will mostly be in hot places but we are also planning to spend some time in the highlands, so we need some warmer clothes. This list also includes the clothes we will wear on departure. I don’t see our family travel packing list changing much when we head off for four months in Thailand and Europe in June, and we will definitely be sticking to carry on only. Our kids are only 3 and 4, so they still get dirty quite easily. Otherwise, I would take less clothes. Fold up backpack for day use. Click here to download this packing list in a PDF! You can also view our family packing list from when we travelled with suitcases or our carry on only packing list for Europe. So, what do you think? 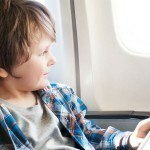 Could/do you travel carry on only with your kids? I’m most impressed that you can get all your luggage into the small bags and it weighs under the 7kg hand carry limit. I find it is not the clothes that take up the space but all the toiletries even using the travel size packets. Hi Sally! Our toiletries do not take up much room at all. To be honest if they were to weigh our bags, we could be in trouble for flights on Air Asia where the maximum weight is 7kg per bag. Thankfully Norwegian Air, who will be taking us to Europe, have a weight of 10kg as do Jetstar who we usually fly at home. I have only ever had my bag weighed by Australian budget airlines, so I am not too worried. Air Asia has not had any problems with us flying with these bags. The majority of passengers seem to have those wheelie suitcases that are the maximum dimensions and I would be surprised if many of them are under the 7kg, but I have not seen any bags weighed. In the interest of full disclosure, we are flying Ryan Air once in Europe. The trunki depth dimension is half a centimetre over their size limits (20cm – which is unusually small), so we have paid for a check in item then. absolutely brilliant post Sharon! 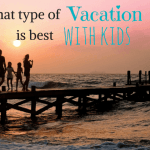 Way too easy to take too much abroad when you travel without kids let alone with the kids! Did you at any point feel like you had forgotten anything or felt as if you could have gone with bigger suitcases or was it really that easy? Hi Jessica! I can’t say conclusively yet as we are only 5 days in, but so far it has been great! We absolutely love having less luggage and I can’t see us changing our mind or feeling like we have forgotten or missed out on anything. It is just making everything so much easier – just packing up when we leave a hotel is so much quicker. Finally, another family doing carry-on only! We decided on carry-on only last year and I have been searching for other families who do the same with no luck until I found your post via Google. We haven’t launched yet, how are you finding COO? ITS AWESOME!! No regrets at all. I only have positive things to say. 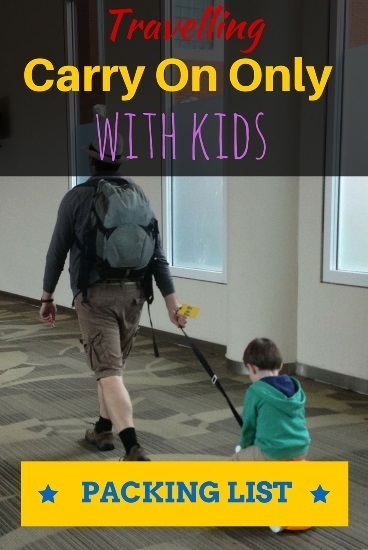 I think families with young kids doing carry on only is a very rare breed! We really have everything we need though and it is making life so much easier from packing to fitting in our apartments with our bags to being able to hire a small car to walking out of airports. So many wins! We are planning a round the world trip with 3 kids (6months, 3yrs, and 6 yrs) next year and plan to do it with carry on only also. I’m wondering how you’ve found the Trunki suitcases for the kids? We have found so many mixed reviews online, I’m not sure if we’re going with something else – I would love to hear your thoughts! Will be following your blog from now on for sure. We absolutely love our Trunkis and for us, it has been the key to our success for going carry on only as we are able to put the kids clothes and toys in them and they are able to pull them – whereas they wouldn’t be able to carry a backpack with that weight and I wouldn’t want them to. Mr 2/3 is not always keen to pull it, but Miss 4/5 absolutely loves doing it. 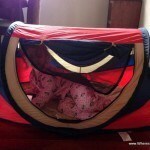 It is also handy for pulling Mr 3 around when he is being annoying 🙂 You can see our full review here. One thing I have learnt is to always pack a spare change of clothes for kids in case of any accidents. Great list, thanks for sharing! 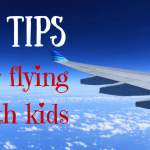 We also travel carry on only with kids, it allows so much more freedom. You should look into a Diva cup to replace the tampons, it’s a great space saver & apparently better for the body & environment. Absolutely awesome list! Thanks so much for sharing! I’ll be printing this for our trip to Sri Lanka!!!!! Recently I found this web, it provides a lot of useful info. I am going to bring my 1st yr old daughter to Melbourne. I am sure we will have great time!! Thanks a lot! Don’t know if this has been asked before but how do you tackle laundry travelling with carry on only? I’m sure the answer is different depending on where in the world but if you gave us a continent-specific answer that would be great, e.g. Europe vs Asia. Thanks in advance. Love your blog! Ps. Found your articles on Penang helpful. We’ve just gotten back to Sydney from our holiday there. Hi Cheryl! Laundry is definitely the most annoying part of travelling with kids. Unfortunately, it varies per destination. I don’t find it a bigger issue whether we are carry on or with suitcases as we still need to constantly do laundry. In Europe, we stayed in a lot of airbnbs and I would filter them based on washing machine, this was easiest! In Asia, lots of places have cheap laundries so that’s good when it exists. In US, many motels have laundry rooms. I would make sure at least every second stop was in one that had this. It takes planning and is very annoying!